FAB POP-UP STORE in Maastricht is the perfect place to shop for a special present for the holidays if you like to get away from all the same old mainstream stuff. It will be temporary opened in Entre Deux Shopping Center in the heart of Maastricht and gives young fashion talents from the Euregio Meuse-Rhein the opportunity to present and sell their designs. At FAB POP-UP STORE you'll find clothes, accessories, jewelry, kids clothes and event clothes for dogs. FAB stands for Fashion Across Borders which is a collaboration of Modemuseum Hasselt, FASHIONCLASH (Maastricht) and Designmetropole Aachen. It's goal is to offer a platform for fashion talents from the Euregio Maas-Rhein. The designers who present their work at FAB POP-UP STORE are An.S., Atelier Milada - Ann Boogaerts, Anya Liesnik fashion design and illustration, ash, barike, BRANKOPOPOVIC, CN JEWELLERY, Collette Klinkenberg, Danielle Vroemen Jewellery Design, Delphine QUIRIN, Dorinda Bielen, Eva Schreuder Ontwerpen, Fabian Seibert SÜLZKOTLETT, Heike Tittes, Henot Marleen, juliette bogers, Katja Sobol, KIRIN DESIGN, konrathvonreumont, LB lena berens, Lies Wambacq 'Juweelontwerp', Lisanne Janssen, Lore Langendries, Lou Bijou by Els Louwette, Maike Gericke Design, marco iannicelli, Marsha Kessels, MIEK, Mieke Dierckx, Nawie Kuiper, nina führer, Noir Near Future, Non Design Label, pot luck, PYG®, sO mINe*, Sonja Schödel and STRIKKS. 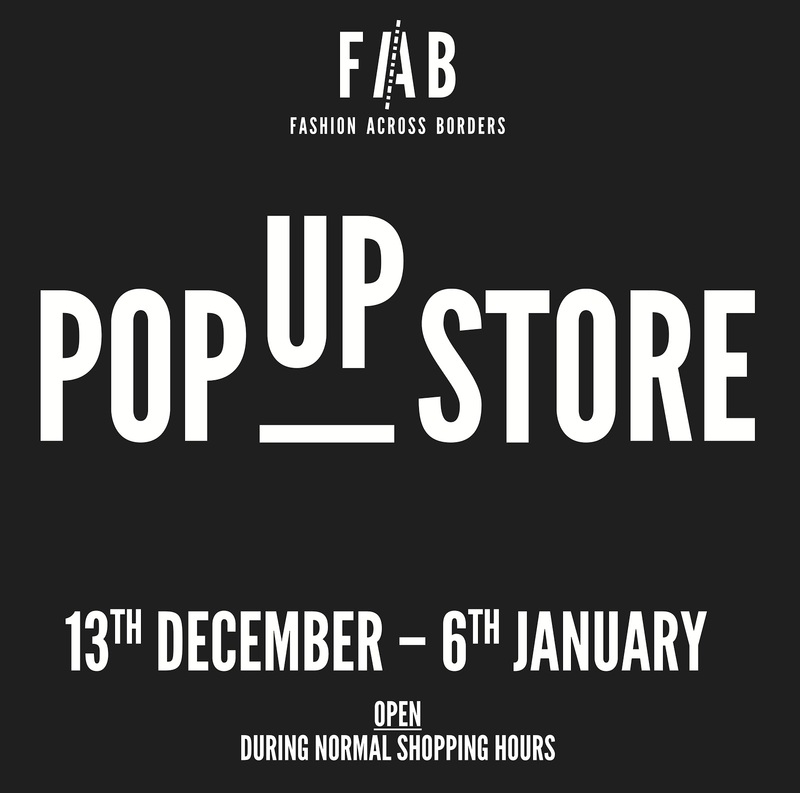 FAB POP-UP STORE will be open from December 13 - January 6 at Entre Deux Maastricht.